DO-95001-05 was succesfully added to your cart. 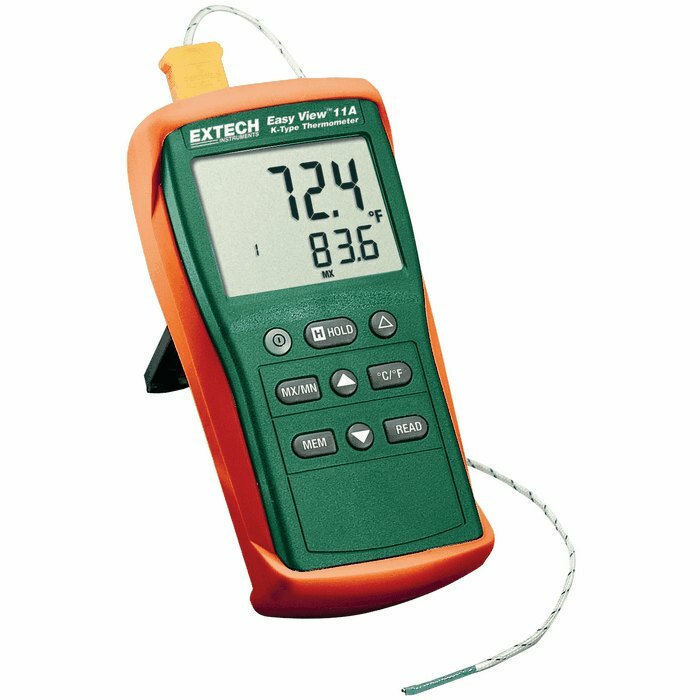 These meters offer the functionality to meet any temperature measurement need. Choose the thermometer with the feature that best fits your application. A single-input type K thermometer which features min/max, Hold, °F/°C selection, and auto power off. one type K bead thermocouple probe, protective holster with built-in stand, and six AAA batteries. Model 95001-06 also includes two type K probes. Model 95001-07 also include two type K probes, RS-232 cable, and software. Could the beaded-wire probe be insert to salty solutions (eg. 3cm deep in solution)? What is the Cat# for this probe? The probe is part number 95001-84, and it is intended for use in air. However, this meter will accept any type K probe with a mini-connector. For a more appropriate probe please see part number 08441-12. This probe is PFA coated to prevent corrosion from the salt solution. Very simple to use, but an additional instrument will need to be purchased to calibrate it. I would look for a thermometer that can be calibrated by yourself without another expensive item.